Moniker makes it easier to transfer domain names to another registrar. It’s been a frustrating six weeks for Moniker customers. After a disastrous switch to a completely new registrar platform, many customers wanted to move their domain names to another registrar. Adding insult to injury, there was no way to get transfer authorization codes in bulk. Instead, customers had to request them one-by-one. 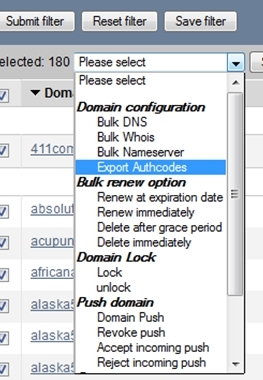 Finally, some good news for customers: Moniker has added bulk auth code exporting. I’m not quite sure when this was added, but I spotted it this morning when I tried to transfer another bunch of domains. First, you need to unlock all of the domains you want to transfer. (I was able to unlock a couple hundred without any errors this week, which is also good news.) Then, select “Export Authcodes” from the drop down menu. Moniker will email the auth codes to you for the selected domains. The confirmation page says you’ll receive an email with the auth codes within “minutes”. Be patient; in my case it took about 30 minutes. One quick note on this. If you do a “bulk search” to select the domains you want to transfer, apparently bulk search has an issue with capital letters. Put all of your domains in with all lower case. It took 24 hours for me to get it. Domains were all lower case. I then merged that with the full list and now I know when they expire. About 10% of domains fail for some reason. Generally they lock themselves again. Auth code time probably a correlation to # of domains. I successfully transferred about 200 domains already in one batch. The ability to sort lists is broken (it seems when they fix one thing, they break another). Notice the number of domains in your filtered list. Now, click on the expiration date column header. Rather than sorting by ascending or descending dates for the filtered list, it lists your entire portfolio. That feature was working, about as well as anything else on their site …until lately. I honestly do not see how they are going to survive. How to disable whois privacy on stupid Moniker.com? We are having similar problems unlocking our names and disabling the whois privacy which was never requested. Dozens of our names have been lost forever, either sold on snapnames for Moniker’s profit or gone to expiration when we could not renew on Moniker when their platform was “upgraded”. This happened even though their CEO assured everyone that no names would be lost due to these upgrades. The ineptness of this company is incredible.